Once you are registered you can start adding your websites. To add a new site to your WP Remote account, click on the cog (see below), then, click on the + button and select Add Site. You will then be asked for the site name and URL. 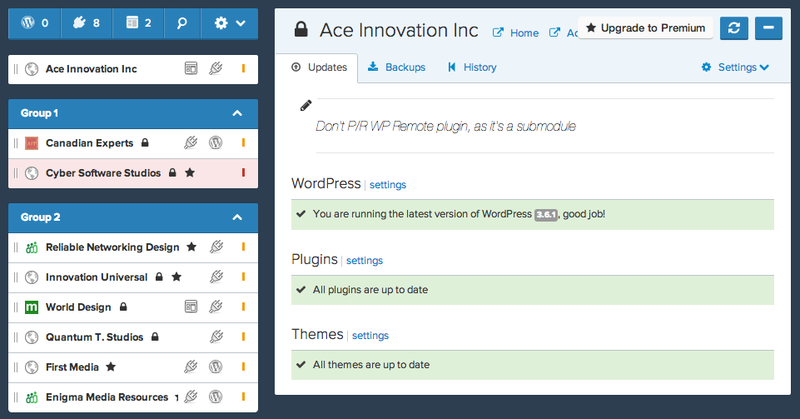 The site name is what the site will be called on your WP Remote dashboard. URL is the site domain name e.g. yoursite.com. The easiest way to get this correct is to visit the home page of your site and copy the information from the browser address bar. Then click the blue Add Site button. WP Remote will load the data from your site; you may have to wait a few seconds while this takes place. 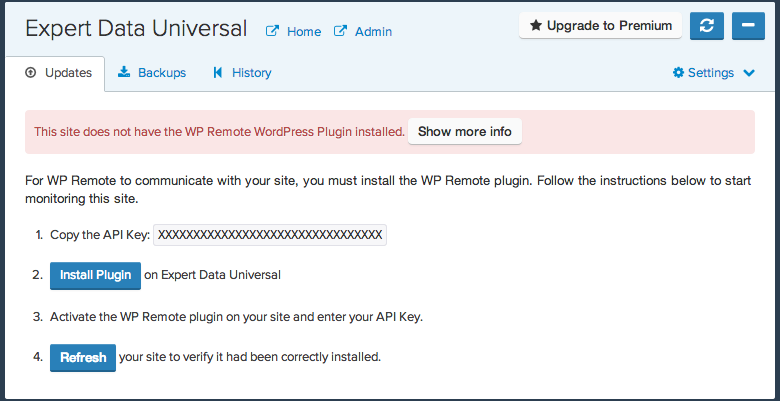 WP Remote detects whether you already have the WP Remote plugin installed on the site. 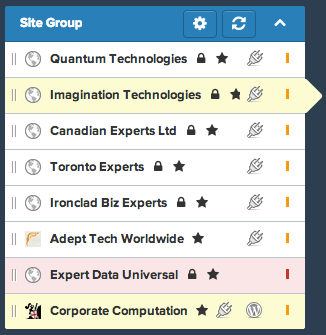 If you don’t have the plug-in installed the new site will show on your site list with a red traffic light. Click on your site in the list and you will be given 4 instructions on the screen. Firstly, copy the API key that you are given on screen as you will need this to active the plug-in. Click on the Install Plugin button. This will take you to your website in a new browser window with the WP Remote plugin selected, ready to be installed. Click on the Install Now link. A pop up will appear and you will be asked “Are you sure you want to install this plugin?” click on OK.
You then need to active your plugin my clicking on the Activate Plugin link. Finally you will need to enter your API key at the top of the screen and click the Save API Key button. You can go back to the WP Remote web interface browser window and copy the API key if you have not done so already. Close the browser window containing your website and return to the browser window with the WP Remote website interface. Then follow step 4 on the screen by clicking on the Refresh button to refresh the site details. Your site data will be reloaded. It will be added to the site list and the latest status of the site will be shown. Your site is all ready to go!